Kids Yoga Stories has another wonderful Spanish story for children. 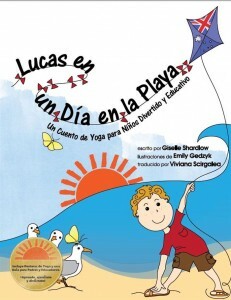 Lucas en un día en la playa integrates yoga into a story and creates an amazing language-learning experience. Children do the poses, imitating plants, animals and other elements of the story, as they listen. This book was created for native speakers, but it is wonderful for teaching Spanish. Lucas en un día en la playa is available on the Kids Yoga Stories website and from Amazon. The book was inspired by the author’s experiences on the east coast of Australia. It tells the story of Lucas and his friends on a school trip to the beach. The bright illustrations and simple text provide an excellent introduction to the animals of Australia and also communicate the important message that we must take care of our oceans and beaches. Earlier, I wrote about how specific features of yoga and Kids Yoga Stories enhance language learning. Like the other stories, Lucas en un día en la playa has a sequence, creates a safe space to experiment and expands global awareness. It also taps into multiple intelligences and helps children relax. You can read more about yoga and language here. – Read the book together first without doing the poses. – Point to the pictures and use gestures and actions to clarify what happens in the story. – Review the words for body parts before doing the poses with your child. –Read the story over and over; repetition is essential for language learning. –Connect the story to kids’ lives. This will help children remember the words and make it relevant. –Appreciate moments of silence. Language learners need time to process what they hear. – Consider buying Lucas y los Animales Australianos de la A a la Z: Un Libro Alfabético de Yoga para Niños para Colorear. This is a wonderful coloring book for Spanish language learners. Some of the animals from the story are in the coloring book, so it reinforces that vocabulary. All the animals in the coloring book are a wonderful way for children to learn more about Australia. Of course, coloring is an excellent language activity. Just point to and talk about the pictures as you draw together. Disclosure: The author sent me a copy of the book to be able to write the article. All of the ideas and opinions are my own.